5.50 points at 18 votes (rank 718). 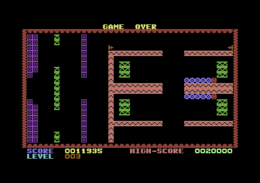 Rombachs C64-Spieleführer 7 September 1984 - "Voting 3"
You need to cross a labyrinth full of indefinable monsters rushing around, deadly worms as swift as an arrow, electric traps and other dangerous adversities, as e.g. walls that should not be touched. 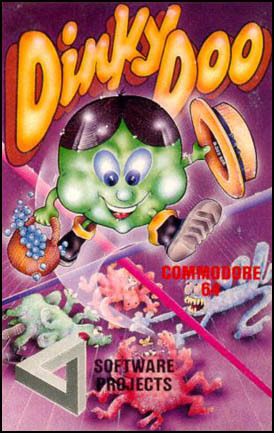 The game consists of 15 different levels, where Dinky Doo first needs to reach the bottle with the magic potion, whereupon the monsters change to fruits, which get you points when you pick them up. The speed is necessary, as the fruits dissolve after a certain time. After getting the bottle a door appears, through which Dinky gets into the next level. In this game timing is important, as the monsters have their given paths and rhythms in which they move. The graphics are kept simple. All the sprites are unicoloured. At the start of the game you can hear When I´m 64. During the game a relatively monotonous melody is repeated. Exact timing is utterly important in this game. First memorise the movement patterns of the enemies and the safe places on the screen and then go as fast as possible to the bottle. Dinky Doo follows the joystick movements. Walls must not be touched, they are deadly for Dinky. Always keep an eye on the bar at the upper rim of the screen. If this reaches zero, Dinky will lose a life. Items such as the transformed enemies or the bottle are collected by walking over them. The version by "Willcox" offers some trainers as unlimited lifes, endless oxygen, collision query off, Dinky with higher speed and selectable starting level. Rombachs C64-Spieleführer: "The idea, graphics and sound are not very inventive. For collectors and for those who don't know the miner programs or blagger yet (Voting 3)." Borna: "Actually it is a typical screen-to-screen skill test, therefore only 6 points from me. Admittedly at theses time such games were played very often - I did it as well. Out of nostalgia I give an extra point (so 5 + 1)." 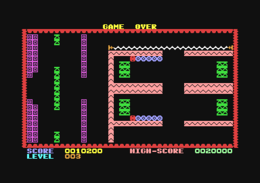 Sledgie: "The game reminds me of my unlimited trials to play Manic Miner. I hate miner games. Therefore only 4 points from me." Shakermaker303: "I enjoyed playing it. I liked the cute monsters. It is no must-have, so I give 6 out 10 points." The Heist "The makeup of the software projects title also suited me very much in Dinky Doo. I also always liked to play the game, as it was a rather cute game, where you could easily touch the corners. As the game was rather difficult or success in the shape of quick level changes was not to be made very quickly, I used a life trainer or sprite trainer, whereby the latter of course wasn't much fun, as you could go through the enemies without harm. It deserves 6 points. By the way, I used sprites from Dinky Doo, that I liked very much, for my VC20 game "Flowers of Evil"!" TheRyk: "One cannot whinge about the graphical and musical design, as well as the course of the game for the year 1984. The collision query with big enemies and too little space is a bit too exact. Through this, the game gets very fumbly, to find out how to solve the next level with the lives that are left. Having to start anew after being in level 3 is not much fun, as level 2 is already finicky. What a pity, so one must say: unfortunately the game is a bit to difficult, but in good average, 5 points."